Good health is a major resource for social, economic and personal development and an important dimension of quality of life. Happily, we Australians do have our good health – at least in comparison to the citizens of many other countries. Our life expectancy (at birth, in 2015) was 82.8 years, behind only Japan (83.7 years), Switzerland (83.4) and Singapore (83.1). Moreover, life expectancy has been rising steadily: boys and girls born in 2013–15 can expect to live around 33 and 34 years longer, respectively, than their counterparts in 1881–90. Similarly, people aged 65 years old in 2013–15 can expect to live 19.5 years (men) and 22.3 years (women) longer than their counterparts in 1881–90. However, it’s not all good news: diabetes is increasing in prevalence, driven to some extent by our growing rates of overweight and obesity, and mental illness is an underdiagnosed and significant problem. Some Australians experience poorer health outcomes, including Aboriginal and Torres Strait Islanders, people living with a severe or profound disability, or with social and economic disadvantage, and those living in regional and rural/remote areas. Nevertheless, all things considered, Australia fares well in many other international comparisons of health. What has given Australians their good health? It’s a combination of factors, including good diets (or at least the means to achieve them, such as widespread availability of fresh food and the wealth to purchase it); high rates of immunisation against many debilitating and/or fatal diseases, and the absence of other significant diseases such as malaria; and an excellent health system that puts some emphasis on prevention of ill-health and maximises our chances of surviving or managing many health problems. Despite our generally good health, the state of our health system is a perennial concern. We worry about the economic costs associated with our ageing population and increasing technological sophistication in health care. In addition, as demonstrated in the political campaign prior to our most recent federal election, the idea that universal health care is under attack is commonly promulgated and believed. 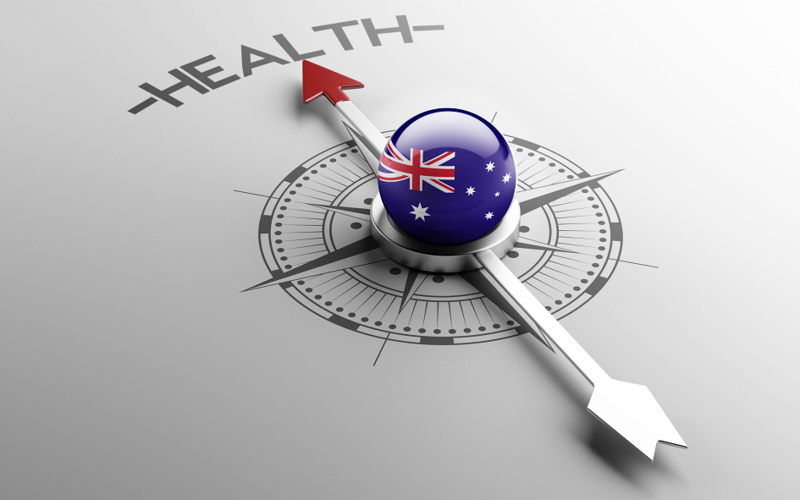 In this article we examine the concept of public health and apply a public health perspective to the current state of, and recent trends in the Australian health system – in particular, the very idea of universal health care. What exactly is public health? Numerous definitions exist; the following are useful for their differing but nonetheless complementary approaches to the concept. an organized effort by society, primarily through its public institutions, to improve, promote, protect and restore the health of the population through collective action. It includes services such as health situation analysis, health surveillance, health promotion, prevention, infectious disease control, environmental protection and sanitation, disaster and health emergency preparedness and response, and occupational health, among others. The Australian Institute of Health and Welfare (AIHW) defines public health as follows. Public health is characterised by planning and intervening for better health in populations rather than focusing on the health of the individual. These efforts are usually aimed at addressing factors that determine health and the causes of illness rather than their consequences, with the aim of promoting health or preventing illness. Public health services are vital to the overall health status and wellbeing of the nation. Improving them can result in major economic [and] social benefits as well as minimising future preventable demand on health services over time. the treatment of individuals as well as encompassing health promotion, prevention of disease and disability, recovery and rehabilitation, and disability support. Collectivity. The wellbeing of the population is prioritised over that of the individual. This is somewhat paradoxical, as all populations consist of individuals, so the population’s health can only be improved by improving individuals’ health. However, the point is that public health actions are population-based and publicly funded (from taxes), meaning that an individual is not directly responsible for the provision of these aspects of his or her own health care. But collective action (through government) sustains activities that cannot be provided directly to or be directly funded by individuals, such as health surveillance and food safety inspections. Equity. Following on from the its collective nature, public health aims to treat all people equally. It does not involve the preferential provision of services to individuals based on income or any other characteristic. Future orientation. Much of public health is about shaping the future – notably, prevention – rather than responding to immediate needs. For example, disease surveillance enables the identification of trends in infections and (if required) the planning of responses to reverse them; immunisation lowers the risk of future disease, disability and death. Public health, or at least a public health system, can also be defined with reference to the alternative – a private health system. Australia’s health system involves a complex blend of public and private providers, the former funded from taxes and available to all citizens and the latter funded privately by individuals who receive care they pay for directly or through private health insurers. Complications arise because private health care in Australia is subsidised by all taxpayers through rebates on private health insurance and because private providers do not provide comprehensive health care; for example, almost all emergency medicine – the single most expensive medical activity – is overwhelmingly provided through the public health system. All countries devote a proportion of their gross domestic product (GDP) to public health. The poorest countries generally focus on the most basic means of improving the health of their citizens, such as provision of clean water and sanitation, and vaccination against major childhood illnesses. Low-income countries are particularly affected by infectious diseases (tuberculosis, malaria, HIV/AIDS, measles), whereas the burden of disease in high-income countries is mainly due to chronic diseases (diabetes, obesity, heart disease, mental illness). Australia and other high-income countries have large public and private resources that can be distributed to health and other priorities such as education and defence. Countries vary substantially in the proportions of public and private funding devoted to health service provision. In Australia, since the establishment of Medicare in the mid-1980s, the bulk of health costs have been met from public funds, enabling universal access to health services regardless of personal income. In some countries, notably the United States, health care is mostly privately funded. According to the WHO, a health system is ‘all the activities whose primary purpose is to promote, restore and/or maintain health’. Further, a good health system ‘delivers quality services to all people, when and where they need them’. As noted earlier, Australia’s health system is a complex network of public and private service providers, recipients and organisational structures. This complexity is unavoidable if the health needs of Australia’s many and varied residents are to be met. Our needs are shaped by many factors, including gender, age, health history and behaviours, location, and socio-economic and cultural backgrounds. Health providers include medical practitioners, nurses, allied and other health professionals, hospitals, clinics and government and non-government agencies. These providers deliver many services across many levels, from public health and preventive services in the community, to primary health care, emergency care, hospital-based treatment, and rehabilitation and palliative care. Public health services are provided by local, state and territory governments and the Australian Government. Private health service providers include private hospitals, medical practices and pharmacies. Although public hospitals are funded by the state, territory and Australian governments, they are managed by the state and territory governments. Private hospitals are owned and operated by the private sector. The Australian Government and state and territory governments fund and deliver other health services, including population health programs, community health services, health and medical research, Aboriginal and Torres Strait Islander health services, mental health services and health infrastructure. Australia has one of the most efficient health care systems in the world, ranked 10th in Bloomberg’s Health-Care Efficiency Index for 2015 (based on 2014 data, for 55 countries), with an efficiency score of 62 per cent and expenditure of 9 per cent of GDP on health. 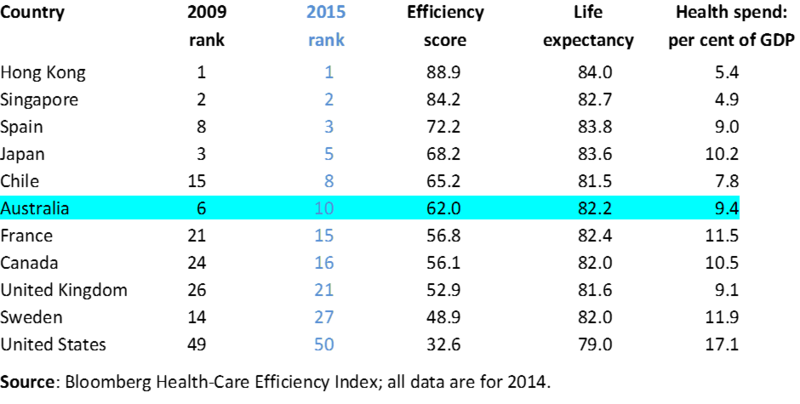 The table below shows how Australia compares in health care efficiency to selected countries. In Australia, around 68 per cent of health expenditure comes from governments. Both public (government) and private health expenditure have grown substantially over the past 25 years – faster than can be expected from population growth and the rising costs of caring for our ageing population. Health expenditure increased from 6.5 per cent of GDP in 1989–90 to 9.7 per cent of GDP in 2013–14. While this is a substantial increase, expenditure growth in comparable countries has been even greater growth in average incomes. Australia’s tax system encourages high-income earners to take out private health insurance to avoid paying a tax penalty called the Medicare Levy Surcharge. In late 2016, after rising steadily for 15 years, the percentage of the Australian population with private hospital cover fell to 46.6 per cent, down from 47.4 per cent two years earlier. In an article in The Daily Telegraph on 14 February 2017, a spokesperson for Bupa, the second-largest private health insurance fund, was quoted as saying ‘private health insurance in Australia is reaching a critical tipping point, driven largely by customer concerns about affordability’. Since 2002, the cost of private cover has increased at four to eight per cent a year — at least twice the rate of inflation (and insurance industry profits have grown correspondingly). This growth seems at odds with the idea that the private health system can provide services cheaply and efficiently, and hence the idea that taxpayers should subsidise private health insurance through rebates. Is universal health care under attack in Australia? In June 2016, shortly before the federal election, Prime Minister Malcolm Turnbull formally abandoned plans to outsource the Medicare payments system, saying that ‘every element of Medicare, every aspect of Medicare that is delivered by government today will continue to be delivered by government in the future, full stop. Medicare will never, ever, ever be privatised. It is a core government service’. Any form of privatisation may well be ruled out while Mr Turnbull remains Prime Minister, but his government’s actions have undoubtedly weakened – or sought to weaken – the public health sector. Reduced Medicare rebates for pathology tests and scans, increased costs for prescriptions, and $57 billion in cuts to health services in the 2014 federal budget do not suggest a wholehearted embrace of universal health care. Perhaps a more telling symbol of the current government’s attitude to our universal health system is its proposal for a Medicare co-payment, which failed to gain sufficient support to become policy. Under this plan, bulk-billed patients would have been charged $7 to see a doctor, with some of the proceeds to be put into a new medical research fund. In December 2014 the policy was amended to a $5 ‘optional co-payment, to be charged at the doctors’ discretion’, but this, too, was eventually abandoned due to strong political and community opposition. Nonetheless, as Ian McAuley (University of Canberra) wrote in The Conversation, ‘two related ideas behind it live on: Medicare is becoming “unaffordable” and our universal health system should morph into a program reserved for the poor’. The co-payment idea came from the Government’s Commission of Audit, which saw the proposal as a first step in a transformation of health services, away from universal system towards an American-style system with ‘expanded private health insurance plans [that] would, at a minimum, cover all services provided by Medicare and public hospitals’. Ian McAuley’s interpretation is that ‘the government seems to be undermining the principle of Medicare as a universal tax-funded program’. Meanwhile, public support for Medicare remains very strong, with nearly eight in 10 Australians describing it as ‘good or ‘very good’ in a survey about the biggest federal government policy decisions of the modern era. Universal health care is popular with the public, but is also an equally popular target for politicians keen to reduce public spending in an era of tight budgets. Given these tensions, the WHO suggests that countries should work towards a ‘new universalism’, in which citizens are guaranteed access to high-quality, cost-effective essential care, as opposed to access to all possible care. Improving prevention, health care and health systems as part of a new universalism will require collaborations between researchers from multiple scientific disciplines and strong partnerships between clinicians, health services, policy makers, consumers and communities. Western Alliance is working hard to promote such relationships in western Victoria. Researchers such as Anne-Marie Boxall and Francesco Paolucci and Manuel García-Goñi have already proposed ways to reform Australia’s health care system to increase its efficiency while retaining its universal character. Such efforts must continue and become part of a more informed public debate.